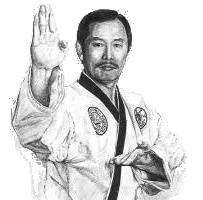 Tae Kwon-Do students should attempt to practice the following elements of courtesy in order to build their noble character and conduct their training in an orderly manner. In Tae Kwon-Do, the word integrity assumes a looser definition than the one usually presented in Webster's dictionary. One must be able to define right and wrong and have the conscience, if wrong, to feel guilt. Listed are some examples, where integrity is lacking. There is an old Oriental saying, "Patience leads to virtue or merit", "One can make a peaceful home by being patient for 100 times." Certainly, happiness and prosperity are most likely brought to the patient person. To achieve something, whether it is a higher degree or the perfection of a technique, one must set their goal, then constantly persevere. Robert Bruce learned his lesson of perseverance from the persistent efforts of a lowly spider. It was this perseverance and tenacity that finally enabled him to free Scotland in the fourteenth century. One of the most important secrets in becoming a leader of Tae Kwon-Do is to overcome every difficulty by perseverance. Confucius said; "one who is impatient in trivial matters can seldom achieve success in matters of great importance." This tenant is extremely important inside and outside the DoJang, whether conducting oneself in free sparring or in one's personal affairs. A loss of self-control in free sparring can prove disastrous to both student and opponent. An inability to live and work within one's capability or sphere is also a lack of self-control. According to Lao-Tzu, the term "stronger" is the person who wins over oneself rather than someone else." "Here lie 300, who did their duty." A simple epitaph for one of the greatest acts of courage known to mankind. Although facing the superior forces of Xerxes, Leonidas and his 300 Spartans at Thermopylae showed the world the meaning of indomitable spirit. It is shown when a courageous person and their principles are pitted against overwhelming odds. A serious student of Tae Kwon-Do will at all times be modest and honest. If confronted with injustice, they will deal with the belligerent without any fear or hesitation at all, with indomitable spirit, regardless of whosoever and however many the number may be. Confucius declared; "it is an act of cowardice to fail to speak out against injustice." As history has proven, those who have pursued their dreams earnestly and strenuously, with indomitable spirit, have never failed to achieve their goals.